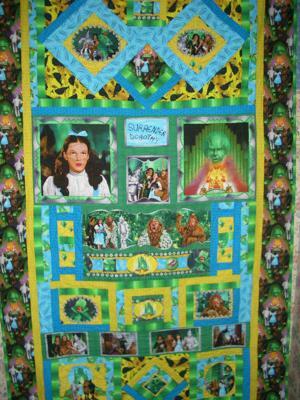 The fourth in my series of quilts using Quilting Treasures Wizard of OZ fabrics depicts the Emerald City and the Wizard of Oz. The greens, turquoise and yellows are so beautiful together and soooo totally different from the other collections. My choice to make this quilt a geometric challenge was interesting. I really liked setting some blocks on point overlapping the border. Using strip piecing made it easy but setting it all together took some time. The green stripe fabric cut on the crosswise adds so much action to the blocks. The Dorothy and Wizard panels are quite ominous. With the "Surrender Dorothy" in the center it continues to tell the story. Notice the yellow background fabric with the beautiful cut emeralds. Also the witch on the yellow background is a powerful print. I have the fifth collection reserved and it is coming out in July, it is The Witches Castle. The last in the series of six will come out in Jan 2010, and is titled " There's No Place Like Home"
Thank you for joining me on my journey to the Land of Oz.